At one time or another I have been a designer, carpenter, inventor, and builder. Now semi-retired, I decided to start sharing a few things, maybe more than a few things, that I’ve created or maybe just observed over a span of more than 50 years. 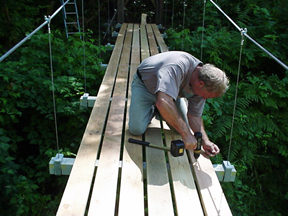 Feel free to browse the old posts and follow me on Facebook – Building a Small Cable Suspension Bridge or Yurt Yaks. Hi, Would you be able to add a link to our website http://www.pumpproducts.com because we sell many of the item you use in your projects? Hi, I need to build a bridge across a 70 ft creek on my property. Your system looks perfrect.